On Wednesday, Finny & I snuck off to the wilds of Ben Lomond, CA--the small nearby mountain town that's home to Hoot, Milos, Alex, and--it turns out--some enormous horses. Despite his concerns, Finn was not eaten by a horse, and he proved more interested in eating sliced apples himself than feeding them to the big guys. Highlights included seeing big Nick (the white horse) drop what his owner called "road apples" (think we've been singing about just that ever since? right you are! ); seeing those carted off in a wheelbarrow; and watching the giant horses roll around in the dust (what Finn called their "play area"). 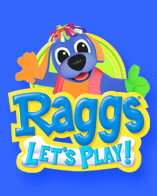 Finny has recently become obsessed with Raggs, a big blue dog with his own song and dance show on PBS. He insists on being called a dog, not a boy, and he won't answer to Finny--only Raggs*! Thank goodness we already have a pair of blue doggy-themed PJ's, which have become the ensemble of choice for our young canine amigo. In other animal news, Raggs has decided that his little brother is a billy goat. We're not exactly sure why he decided to classify his brother as a goat, but it was prescient, given Henry's proclivity to try and climb anything and everything he can get tiny feet (hooves?) on. If anyone had told me a few years back that I'd now be coming home to a big blue dog and a billy goat, I never would have believed them. But, you know, they make cute pets! -- Me (to lady): Hi--do you guys have any kid-sized lemonades? -- Finn (er, Raggs): I'm a dog! -- Me: Okay, do you guys have dog-sized lemonades? -- Raggs: I'm a dog!! 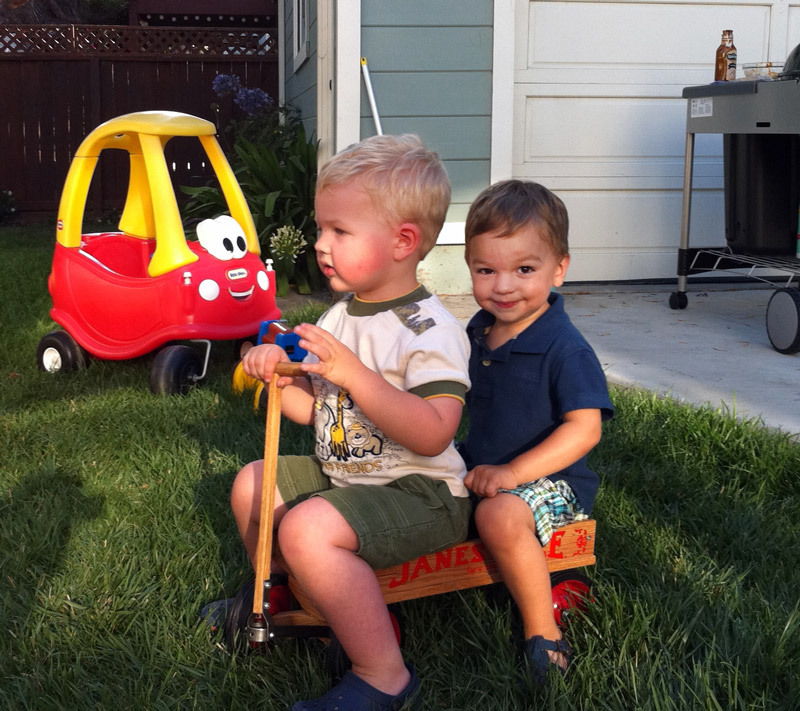 On a related note, Finn & Quade enjoyed some two-man driving of a little wooden wagon from my cousin Anne. (Here's a picture.) 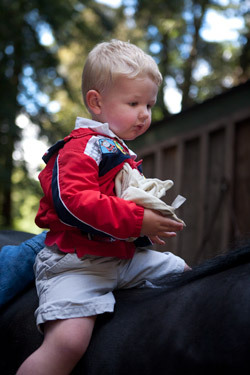 Yesterday Finn sat down on the wagon, paused, and said, "I don't have a little buddy to ride with me. Those guys aren't coming over this day." 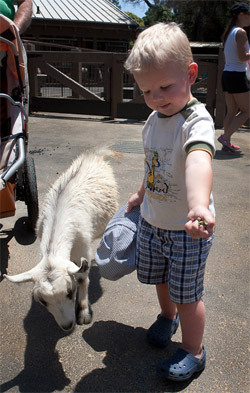 After a little reflection, though, he noted, "Maybe we could get that little Billy Goat [Henry] to come ride." During my folks' recent visit, Finn took quite a shine to helping with some gardening tasks, to the point that I now have to keep him from "weeding" the lawn bare. Even little Henry got in on the action, brandishing his own tools. Finn and Grandma Nack teamed up to stuff his new giraffe (whom he curiously dubbed "The Badaff") full of cotton balls, and he and both GPs enjoyed lots of quality storytime. 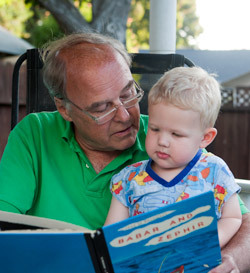 In particular Grandpa Nack invited Finn to the gazebo for some thrilling readings from my childhood copies of Babar books. I can't tell you how great it was to see the two of them delighting in tales of mermaids, lost monkey princesses, kleptomanical crocs ("bad dudes! "), crude dummies, and more. 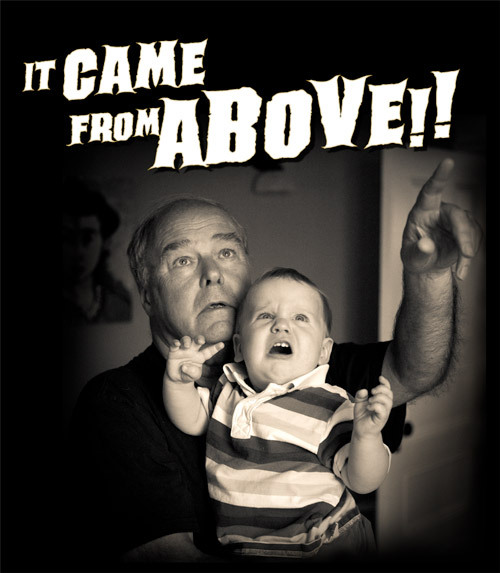 Here's the customary little gallery (HTML). Pinecone Jam! And Other Goings-on. Dad-o was out of town on Friday and Saturday for a business trip, so I got to spend lots of solo time with the guys. I decided it would be fun to fill up the wading pool on Saturday morning since the weather promised to be sweltering. I figured we'd fill it up but wait to dive in until lunchtime when the sun had warmed up the water. Well, the Dudes did not want to wait, so it was clothes off, dipes off, and into the pool! Finn was busy dropping all kinds of toys and other items into the pool, including a pinecone he picked up out of the mud by the gazebo. 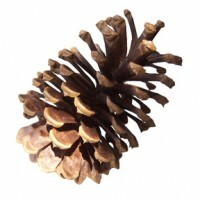 As the pinecone went in and the mud bits sank down towards the bottom, Finny mumbled something that I didn't quite hear. I asked him what he said, and he said "Pinecone Jam." It took me a second, but then I said, "Oh, like toe jam?" And he nodded and smiled. In Henry news, our little guy had his 1-year checkup, and clocked in at 24 1/2 pounds, 29 inches long, and 48cm. head circumference. He's only in the 25th percentile for height, but 75th for weight, so we're expecting a growth spurt soon that should stretch out that spare tire! He's got a total of 13 teeth, 4 of which have arrived in the past week or so, and he is crawling like he's trying to set land speed records. Tonight I walked to the kitchen to get him a pre-bedtime bottle of milk, and I heard him crawling toward me saying "mama mama mama" over and over. My heart melted. He continues to be fascinated with his brother's toes, utensils, and sippy cups, to which Finn usually responds "no Goonie, don't touch my (insert posession/body part here)." Someday, technology will allow us to jump a few seconds back in time (TiVo-style) to record marvelous moments that have just transpired. And given that by then we'll also have time machines (right? ), I'll return to last week & capture one of my favorite Finny moments ever. Last week the boys and I, together with Grandma & Grandpa Nack, headed over to Happy Hollow, the nearby park & petting zoo. This time I came loaded with quarters, all set to buy handfuls of snacks for the various goats, sheep, and donkeys on hand. Everything went great until the end, when instead of a mere handful of food, I gave Finn a whole Ziploc bag. The horned amigos made a beeline for the big guy, prompted him to start panicking, "Oh no, oh nooo, don't EAT me, goats!!" I put down my cam and quickly broke up the pack, knocking the chow to the ground & drawing the goats away from Finn. Poor dude--but he recovered fast, and ever since we've been laughing it up about those hungry, hungry goats. Here's our gallery (HTML). in a bone-chilling adventure battling the sinister forces of Nack family light fixtures!! What a nice birthday party we had with our little buddy Henry! A posse of niños, including Harper, Charlotte, Dominic, Ken, Julian, and Madison, along with their respective parents & of course Grandma & Grandpa Nack, were on hand to help us celebrate. Carrot cake, juice boxes, and other treats were flowing near the guys' new sandbox. 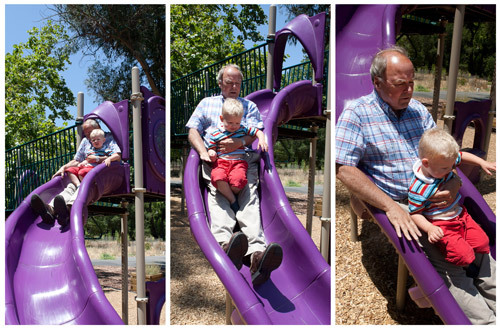 Mom-O & Dad-O remain kind of bushed, so without further ado, here's our gallery (HTML). By the way, with the Flash galleries, if you happen to be using a large monitor and like high-def images, try pressing the little square in the lower-right corner to get a full-screen display. Press the ESC key to exit when finished. Oh my goodness. Henry is one year old today! 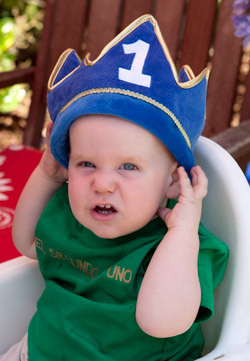 We can hardly believe a year has flown by since he arrived on the scene last year after only 1.5 hours of labor. Our littlest dude has got a lot going on these days--so busy growing, growing, growing. He's getting ready for many more teeth to arrive--they're making themselves known in big bumps and lumps in his boca. He's been working really hard on practicing his walking, forcefully leading his hapless escorts around the house and getting very upset when we want to take a break and sit him down on the floor! (I am prone to calling him "Stampy" because of his disproportionately heavy footsteps!) And he's really starting to chatter away. Lots of babbling and even some honest-to-goodness words like Dada, Mama, ball, cool, go, Coco, and uh-oh. He loves his little sleeping buddy Ollie, and has warmed up to his stuffed cat (an Xmas gift from Grandma Nack). More Henry-based action includes "rock stance": standing with his feet wide apart and jiggling one leg up and down (think David Coverdale in the 80's). In addition to assisted walking, he's able to pull himself up to standing unassisted, and has even stood (stock still) on his own for several seconds at a time. Dad-o has introduced Henry to "fountain inspection" both at our newly repaired fountain as well as neighbor Richard's kid-magnet front yard fountain. I'm only half joking when I call Henry my bossy baby. He wants to do everything himself, and when he needs your help he's very clear about what he does and doesn't want you to do. If you try and feed him, he grabs the spoon or piece of food and puts it in his mouth--he doesn't want us doing it! He's gotten into some serious chug-a-lugging, grabbing both his and Finny's milk cups and jamming in both sippy lids at once. He'll also let us know if and when he wants to be held (or not!) and is remarkably strong for his size (evidenced by pushing himself off me when he's had enough of my lap). This week he's gotten in plenty of playtime with Grandma and Grandpa Nack, and was introduced to his very own sandbox (a wonderful gift from them) this evening. After his initial uncertainty about sitting in the sand, he got pretty engrossed in scooping and pouring. Every day this week has been an adventure--trips to Happy Hollow, Blackberry Farm, and other parks, along with shopping trips and picnic lunches. He was yawning his brains out by 6:30 this evening--I've never seen him that sleepy! But now that he's in bed he's having kind of restless sleep. Maybe he knows his birthday party is tomorrow! Happy Birthday little G-Man! We had a great time celebrating the 4th of July with our squirrels. It was a gorgeous, sunny day ("nottoohot!" as Finny would say), and we spent most of it outside. 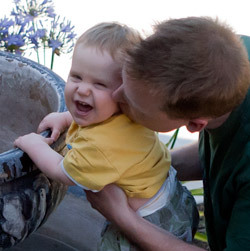 First off, Dad-o and Finny hit the hardware store for some mulch and tomfoolery with plumbing fixtures. At one point, Finny dubbed Henry "Flying G" after seeing us lift Henry up off the ground by his arms to get him up stairs & over curbs while he practices his walking. We think that's a pretty terrific nickname to add to the list! Then it was off to a neighborhood barbecue at lunch time, complete with water balloons, games, hot dogs, and popsicles. When we returned home, our long-dormant fountain was burbling away, thanks to our supercool neighbor Richard. 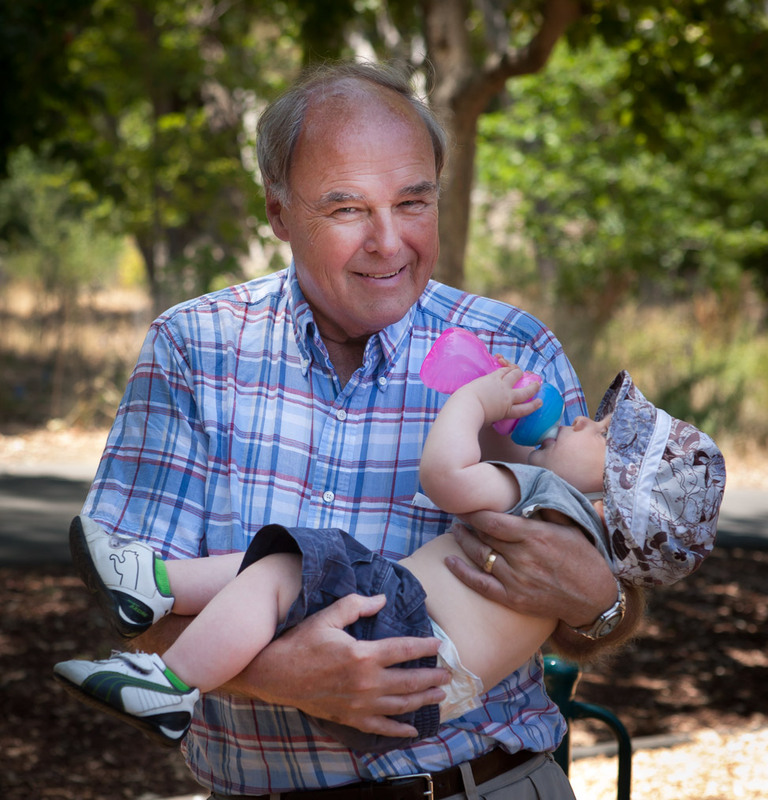 After naptime, we played in the yard then headed out for a BBQ with some friends and their kiddos, both of whom are Finny's age. Henry really dug the Radio Flyer and eating ice from the cooler, and Finn was having a ball in the cardboard box fort and riding around on kamikaze-style on a scooter in the driveway, crashing it into the bamboo like the Japanese chimp in one of his favorite YouTube videos. Here's our little gallery (HTML). As for Mom-o and Dad-o, we enjoyed the company of some other adults (woohoo!) and the fruits of our friend Derek's labor over the Weber grill. Our dudes were pretty exhausted by the time we got them home and rolled into bed. We didn't hang around long enough to catch any official fireworks, but the M-80's being detonated a few houses down the street kept us (but not the dudes!) awake for a while. I've long thought that the phrase "kid in a candy store" should really be "kid in a hardware store." Finn & I have enjoyed untold hours cruising the aisles of the nearby OSH, futzing with flanges, banging on PVC "drums," marveling at weed whackers, and more. This past Sunday he somehow conned talked me into buying a little clog-busting "drain snake"--just a peg and a handle on the ends of a flexible metal rod. 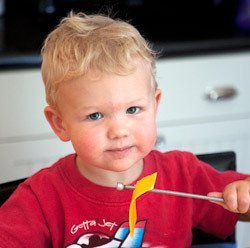 He was enthralled all day with it, at one point fashioning it into The World's Least Efficient Utensil. 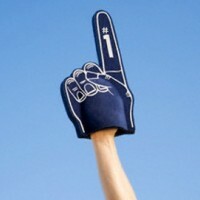 Here's a handful of images (HTML). The Nack Family Homebody Emancipation continues! 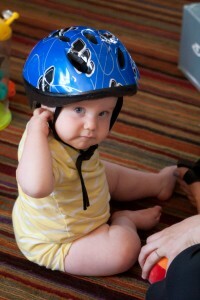 On Sunday Finn & rolled to the bike shop to score a new helmet for Henry, meaning that he'll soon be able to join us for rides in the great two-man Burley trailer that my folks gave us at his birth. Let the rolling son-der begin!